You could say Bob was born to be a professional griller, growing up in Palestine Texas, a small town known for barbeque, he started cooking barbecue at the early age of nine. His aunt Tiny taught him a recipe that had been passed down for generations so Bob continued to build on what he had learned and created his own seasonings, sauces and cooking techniques. 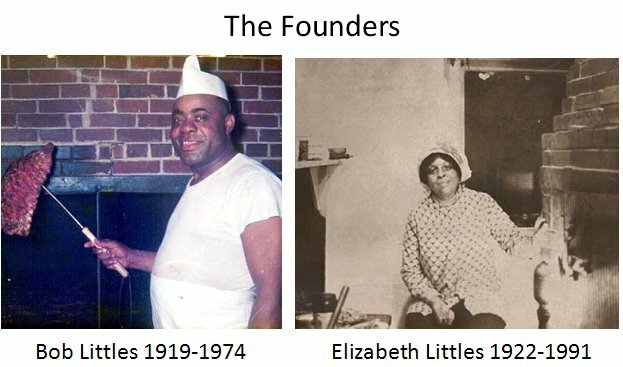 At age sixteen, He and Elisabeth Word were married and together they owned and operated Their first restaurant. It was mainly a burger shop but of course barbecue was on the menu. Bob enlisted in the Army where he served the United States as a cook during WW2, there he learned professional culinary skills. With his wife and his two daughters, Robbie and Carolyn he moved to Fort Lewis Washington Where he was stationed. It was not long before he realized that in that part of the country what they called barbecue was really nothing more than Meat cooked in an oven with catsup sauce on it. They really needed his help! After serving his country, he and Elizabeth decided to stay in Tacoma Washington, where TheY soon began looking for property where he could build his dream restaurant. Like his first restaurant, he wanted a place where people could come in and feel at home, dance, talk, eat good food but most importantly, enjoy real Barbeque. In 1948 Bob and Elizabeth realized their dream and Bob's Bar-B-Q Pit opened its doors to Tacoma. Bob and Elizabeth Littles Ran the restaurant together until 1974 when Bob past away, by then Bob's Bar-B-Q was a household name. Although it was hard work, Elizabeth kept the restaurant open with the help of her daughters Robbie and Carolyn along with their grand children. They were able to keep the place open until 1983, when Elizabeth realized it was time to retire. So she sold the restaurant and all the property and it was thought that Bob's Bar-B-Q was gone for good. Or was it? Years went by, and for a long time it seemed that Bob's Bar-B-Q was really gone, but people still could not forget the delicious hickory smoke flavor barbecue that generations of Tacomans had grown up eating. One day Bob's family was having a private home barbeque at The family home. As people walked by they couldn't help but smell the rich aroma of something that reminded them of a place called Bob's Bar-B-Q. One asked, "is this the barbeque that yall used to cook at your restaurant?" "Yes it is the family replied." He then asked, "can I buy a plate of ribs?" hesitant at first, "Carolyn said sure." After eating every rib on his plate and almost eating the bones, the customer said, "that was the best barbecue that I've had in years, it sure brought back memories of your Dad's place. How come you don't open another restaurant? because I will be dreaming about these ribs for days and I sure would like to get more." It was then the family realized it was time to reopen Bob's Bar-B-Q Pit, so together with the help of Elizabeth Littles, who was still alive they began practicing and perfecting the art of barbecue again. Although years had past Elizabeth still remembered all of the recipes so she began to teach them to her children and grandchildren just as Bob's aunt Tiny had done for him and generations past. Mostly doing small outdoor vending booths at several different community events. Well excepted and appreciated by the community we all knew that we still had a great product and after winning the Taste Of Tacoma best barbeque award it was time to open a restaurant. Grandmother (Elizabeth Littles) was delighted! She later past away in 1991 but not without leaving her family a legacy and most important, a recipe. Today Bob's Bar-B-Q Restaurant is still alive and kicking, located at 911 S. 11th st in Tacoma WA. Bob's restaurant is owned and operated by Carolyn and her sons Michael and Jonathan Clark. While the outdoor Community events are done by Robbie and her husband Richard Beasley along with their children Kim, Robert and Elizabeth. Of course Robbie and Carolyn's grand children work with them and continue to learn the family tradition. Guarantying that Bob's Bar-B-Q Pit will be around for the next generation and the next. If you are ever in Tacoma, you must stop in and try some of what many call, the best barbeque in the world. But if you never make it there you can still purchase some of Bob's Texas Style Barbecue Sauce, we will be more than happy to send it right to your door.